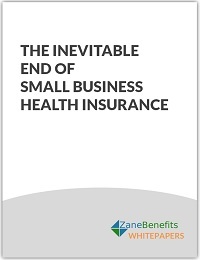 Zane Benefits, which provides small businesses with simple and friendly healthcare solutions, announced today the publication of a new Whitepaper “The Inevitable End of Small Business Health Insurance”. According to the Whitepaper, the percentage of Americans covered by job-based health insurance has steadily declined since 2000. While the transition from employer-based health insurance to individual health insurance has been gradual since 2000, the post-2014 enhancements to the Individual Market are now accelerating this shift. According to Lindquist, the Individual Market is expected to expand from 30 million insureds in 2012 to more than 150 million insureds by 2025. The Whitepaper focuses on the first phase of this shift, which will be led by small businesses, and predicts that 60 percent of small businesses will eliminate traditional employer-sponsored health insurance in favor of Defined Contribution Healthcare and individual health plans over the next three years. The new 20-page Whitepaper is available for free download at the zanebenefits.com website. Minimum contribution and participation requirements are forcing small businesses to stop offering traditional health insurance plans. In order to offer health insurance, small businesses are required to contribute a minimum percentage of the premium for each employee (typically 50 to 75 percent). Additionally, coverage may be rescinded if a required number of employees do not enroll in the plan (typically 75 percent of eligible employees). The number of small and medium businesses (with less than 200 employees) offering coverage is down from 68 percent in 2000 to 57 percent in 2013. The post-2014 Individual Market’s features of guaranteed acceptance, choice, portability, and tax credits have made individual health policies more attractive to employees than employer plans. The number of policyholders in the Individual Market reached 30 million in 2012 and is projected to increase to more than 150 million by 2025. New Defined Contribution Healthcare arrangements allow small businesses to reimburse employees for their individual health insurance costs – enabling small businesses to offer employee health benefits for recruiting and retention purposes without absorbing the premium and administrative costs of sponsoring traditional group health insurance. Due to advantages of the post-2014 Individual Market and the availability of new Defined Contribution Healthcare arrangements, 60 percent of small businesses will eliminate traditional employer-sponsored health insurance in favor of Defined Contribution Healthcare and individual health plans over the next three years.